I have always enjoyed Disney. I have always enjoyed reading (at least I don't recall a time when I didn't like to read). 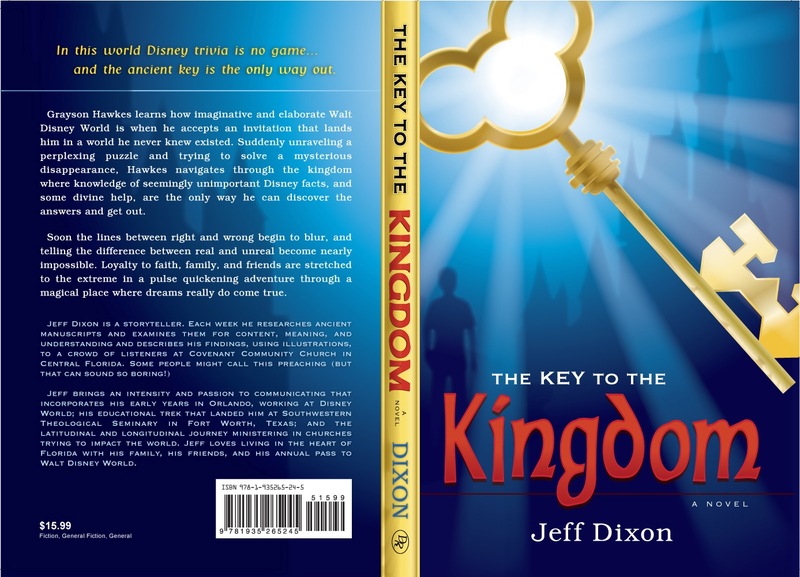 So, when I was given the opportunity to read and review the new book by Jeff Dixon, The Key to the Kingdom, I was intrigued. The book is essentially a mystery. The main character, Grayson Hawkes meets with a friend late one evening and he shares some information about the history of Walt Disney and Walt Disney World and gives him a gift and his first clue. The story follows Hawk through Walt Disney World as he tries to understand what his friend told him before disappearing and works his way through a series of clues looking for the answer. I expected there to be some double meaning in the title of the book, as Hawk also does happen to be the pastor at the Celebration Community Church. There are some mentions of discussion of religion and some portions of the story take place within the church, but it certainly is not a focus of the story as I thought it might be. I am okay with that, just surprised. The book is told through the use of a narrator, who has insight on the thoughts and actions of Hawk, with dialogue driving much of the story. The book jumps right in and starts the story. There is only minimal character development in the book, but it feels okay. The story focuses more on the progression of the solving of the clues, providing some character detail in the process. The pace of the story is quick and is broken down into many short chapters (which for my just one more chapter approach to reading at bedtime, makes it a lot easier to talk myself into one more chapter). The style of the writing is very different from other books that I have been reading lately, it seemed less "deep", probably becuase of the minimal character development and the short chapters breaking it up. Still, with the pace of the book, it works. As I read (and having read the disclaimer at the start of the book), I found myself wondering how much is real and how much is fiction, in terms of the history, the trivia and the locations within the park. Based on some information on the book's website, there is at least a portion that is real. Reading the book certainly has me looking forward to my trip to Disney, I want to look for some of the sites that are referenced and see for myself what references are real. Put out by: Bring It On Communications! You can purchase the book through Deep River Books, Barnes and Noble, and other retailers. 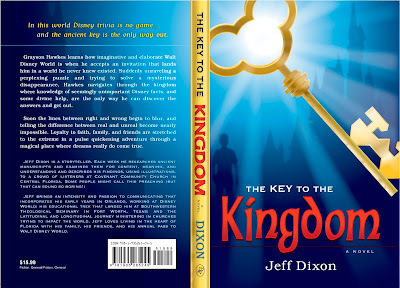 You can Like Key to the Kingdom by Jeff Dixon on Facebook, and http://twitter.com/deepriverbookson Twitter. Thanks so much for taking the time to read and review The Key To The Kingdom. The book begins by stating a series of facts. In many ways the book can be described as factual fiction. It was my intention that the deeper you moved through the book the more you would begin to wonder what was real and what was created just for the story. I have been flattered by the number of people who have expressed their intention of taking the book with them into the theme parks and searching for the clues that the characters discovered. They will not be disappointed and most of the places and clues that were in the book can be seen when you pay attention to the details of Walt Disney World. A little mystery, a few puzzles to solve, some interesting people, and a magical setting help to create what I hope is a fun-filled, fast paced, and satisfying way to spend some time getting lost in a story. I hope that others decide to make a trip into the world of Grayson Hawkes and solve the mystery of The Key To The Kingdom for themselves. Thanks again for your comments and thoughts. Yoplait Kids - Free 4 pack offer! Yoplait Kids Yogurt Prize Pack Winner! Moolala Daily Deal - 80% off at Mixbook! Chick-fil--A Free Waffle Fries today!